When you’re making plans to visit, or work within Australia, having the most fundamental and appropriate form of health cover is absolutely necessary. This is even more critical if the goal is to meet your couples 457 visa health insurance requirements. Further, because you never know when accidents can incur, having this kind of protection through Australian Unity can help you avoid those extremely high medical costs that visitors can be smashed with, if they have no cover in place! Let’s not forget that Australian Unity is also one of the oldest health companies within Australia. This company has been trading for well over 170 years, so visitors interested in choosing a cover that also offers financial services will be more attuned to Australian Unity. This is also one of the largest ‘not for profit’ health cover providers for overseas visitors as well. Optional Extras Insurance cover is also available, offering a selection of day-to-day health services such as major dental, optical, pharmacy, or massage. Now, to put the Brule cream on the pudding–Australian Unity guarantees receipt of the visa compliance letter far faster than what the competitors provide! If you add in the fact that every feature of Australian Unity ensures all necessary visa requirements are fulfilled fully–it is obvious why it is a popular cover choice for so many. Let’s examine some other reasons as to why this cover plan is ideal for so many overseas visitors. Why Choose Australian Unity For 457 Health Insurance? 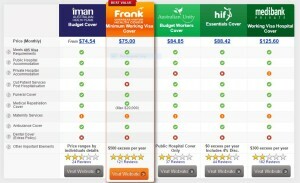 Australian Unity has the third lowest (entry level) price for a budget workers cover policy. Let’s not forget that this particular cover does comply with all of the 457 visa requirements. Once again, visitors are looking for a cover that will guarantee visa compliance. As mentioned several times, this budget cover meets all “adequate health cover” needs and offers a range of options. Since the adherence to these rules and regulations is so critical for working visa holders, Australian Unity is often chosen over others, due to good ratings in this area. Overseas visitors are going to be amazed at the level of flexibility Australian Unity rewards. Unlike many funds such as IMAN in particular, this cover allows you to have the freedom to mix and match your health cover features. You choose what is going to meet you and/or your families needs the most. Let’s just say that you want the “budget workers cover” but you also want to add a more expensive comprehensive feature. This could be anything from dental care to optical solutions. You decide, because you’re not limited. In other words, YOU choose what you can afford comfortably. Australian Unity is also one of the very few popular cover funds that ensures preventative health benefits are available! 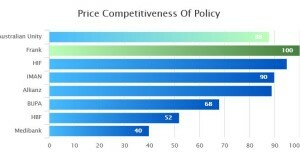 Of course, overseas visitors have to go up a tier on the health cover option they choose to access these, but with all that is gained, it is more than affordable! These extra features include receiving pertinent doctor check ups, fat-loss programs and even personal health coaching! Very few other health funds give such choices so affordable. If visitors do choose to stay with the budget workers cover option they will still have some amazing features like these listed below, which are always included. What this really means is that if you fall seriously ill, or you become injured in some way which requires medical repatriation back to your home country, the limit is that set $20,000. What is disappointing is the fact this is significantly lower than what many other Australian health insurance companies offer. Now, naturally it is up to the potential member to decide how important this specific feature actually is to them. As mentioned previously, one can never know when an accident might occur, let alone an illness. It is an important feature of any health cover plan. Who Is Australian Unity’s 457 Health Cover Best Suited To?